“Sales Differentiation” is a deep-dive into the aspect of selling that salespeople struggle with the most – how to differentiate your solution in ways that are more meaningful to your buyer. And in the process, commanding higher prices. Never say that your solution is the best because everybody else says that – and it actually will push the buyer away from you. There is a difference between Marketing Differentiation and Sales Differentiation. Marketing Differentiation is your company’s strengths that appear on your company’s website. Sales Differentiation consists of specific differentiators that are positioned with each buyer, and each buyer-type. When a salesperson doesn’t understand a buyer’s needs he/she will fall back on marketing differentiators, which don’t help you close more deals. Sales differentiation is the responsibility of the sales department, not marketing. We salespeople too frequently offer up a differentiator without providing the customer with specific context as to what this differentiator means to the buyer. Saying we are the “#1 supplier” in our industry without explaining why size matters could then be interpreted as a negative by the buyer. Or, our larger company size can be sold as a negative by one of our competent competitors. The key takeaway for salespeople is to connect each differentiator to the specific challenges, criteria and/or personal experiences of each buyer. Then your differentiator has value in the buying process which is, as Salz says, the core function of a salesperson. Salespeople often wait for price to become an issue and then try to differentiate themselves. This is too late. The buyer’s question “Why should I buy from you?” should be answered by salespeople before the customer asks it. Sales differentiation, according to Salz, is not so much about what you say to a buyer. Instead, it’s about the questions you ask that highlight for buyers the specific issues and capabilities that differentiate you. So, what are your solutions’ key differentiators, and what questions can you ask to elevate the importance of those differentiators in the buyer’s mind? Lee Salz’ subtitle says it all: 19 strategies to win more deals at the prices you want. The strategies are separated into two parts. Part One of the book describes eight strategies for identifying and communicating the differentiators of your solution. Part Two details eleven strategies for differentiating how you sell from your competitors. I highly recommend this book to every salesperson and sales manager who struggles with the issue of price – which is, of course, everybody. 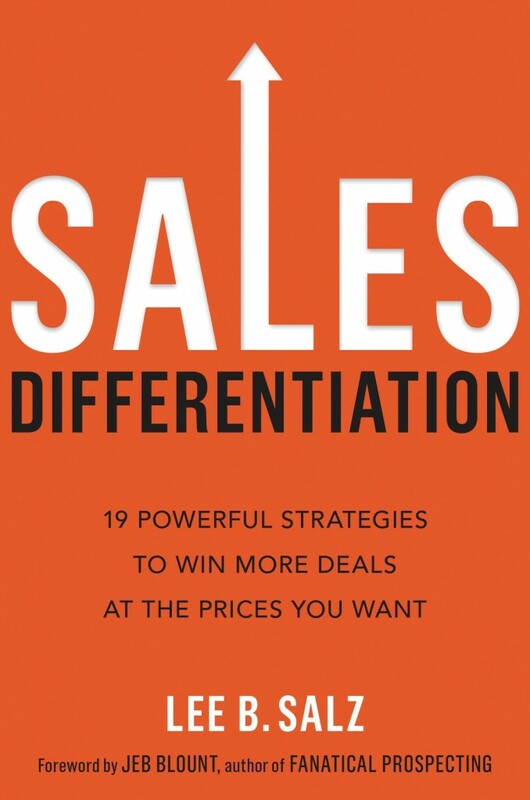 Sales Differentiation is now available on Amazon.